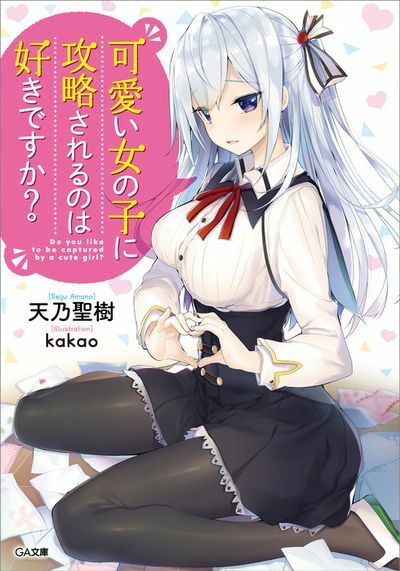 J-Novel Club Forums | Kawaii Onna no Ko ni Kouryaku sareru no wa Suki desu ka? Kawaii Onna no Ko ni Kouryaku sareru no wa Suki desu ka? Side Note: Since I did such a terrible job and received "backlash", I'm going to try and do this series justice by using google translate and rewording everything so it actually makes sense! Synopsis: The story centers around the MC who is an emperor and plays a game of love with three girls and the twist being to become a slave if the MC admits he likes one of the girls! There are three girls in total two siblings and a fiance all attempting to seduce/attract him, as love begins to blossom between them how will this game of loss play out when the MC has his life(not literally as of now) on the line?! My thoughts: The series seems to sound like a fun read, I like the designs of the characters and I think there's fun to be had with this series! It also seems like this series will take some turns with it being death and not slavery if the MC loses, Spys, War of Love and of course much more! On top of all this the being captured part hasn't seemed to take place yet or even at all so it could have a different meaning or something! Well... any plot/summary? Also if you could include at least one of those images you mentioned. Otherwise it is almost impossible to upvote it like this. Ah, I see what this one is I think from Twitter. I've seen the covers. Here's a Twitter post of cover 2 (I believe the white haired girl is the love interest; male protag). @acrescenia as the OP you should at the very least have a synopsis of the story and put in a little bit of effort and research into this (even if you just post a Google Translate of the synopsis). This just will not get many up-votes if you don't. ok, cute art, but it's about what now? Google seems to reveal more pics of these girls in varying states of undress, so we know the plot but not the plot as it were. I can't find a novelupdates or any other link with actual detail - thought I found one on kissmanga for a manga adaptation, but that was a diff series with a lots of the same words in the title. Alright, I found it on Bookwalker. "Do you Like to be Captured By Cute Girls?" It sounds like a highstakes game, with the competitor trying not to fall in love (since it will mean the end of his life... Literally or figuratively, I dunno). Mentions of empires and emperors. Most of the imagery in this one is the girls trying to tempt him it seems. This an SB Creative / GA Bunko work. well now from what I understand of the Google Translate, This looks pretty interesting. So I will give an Up-Vote. "Do you like being caught by pretty girls? " Volume 3 will be released around September 15! Synopsis etc. will be introduced as soon as restrictions are lifted. I'd like to thank you for your love of the affair game which is getting more and more heated up! Updated the post hopefully it's better now! Also writing this so this can go back up on the Forum for a second chance!
! There are three girls in total two siblings and a fiance all attempting to seduce/attract him, as love begins to blossom between them how will this game of loss play out when the MC has his life(not literally as of now) on the line?! Sounds like a high stakes game. I'll buy. There's some images from volume 4 here.